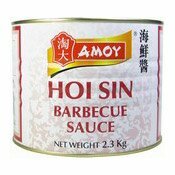 Amoy Hoi Sin Sauce is a Cantonese speciality used widely in Chinese cooking. It is essential as a marinade in classical dishes such as Cantonese Roast Duck, Char Siu Roasted Pork and Barbecued Pork Spare Ribs etc. It is also used for a number of seafood and chicken dishes, and of course many restaurants use it to serve with the famous Peking Duck.